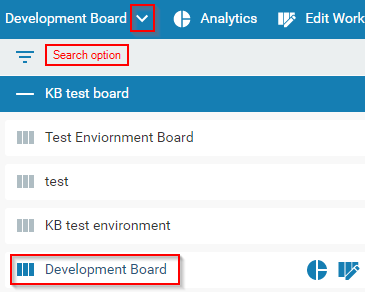 For your convenience, in Kanbanize 6.2, we have rearranged certain UI elements at new, more intuitive locations across the screens. All tabs have a new and improved appearance and some of the panels have been also redesigned. The design of the Board header is modified for a better visual appearance and user experience, including revamped icons and positioning of the UI elements. 1. The Board name has a visible drop-down menu and a search option is available. Use the downward arrow to expand the menu with your boards. The board you are currently working with is highlighted on the menu. 2. The Search tool has been slightly modified to match the new design of the application header. To open the advanced search facility click on the magnifying glass icon (1). To load some of your saved searches, click on the arrow icon (2). 3. Better looking and more comprehensive In-App Notifications with card events. (1) Create a Card/Initiative (2) Board Filter (3) My Queue and Worklog (4) Related Boards (5) Board Background (6) Import Cards (7) Configure Card View (8) Invite users (9) An ellipsis that denotes additional features: Calendar, Board Settings, Board screenshot. (1) Create a card - users can create а new card and/or an Initiative via the "plus" button on the top of the new sidebar. If the user has activated both the Card Workflow and the Initiatives workflow, upon selection of the "plus" icon, the feature prompts you to decide if you want to create a card or an Initiative. If the user operates with the Cards workflow only and the Initiative workflow is not activated, they can create only cards via the "plus" icon and vice versa. (2) Import Cards - the cards can be imported to Kanbanize with an old date so that Project Managers will not lose the track of metrics and can take advantage of the Kanbanize analytics modules. (3) Invite users - use this icon to navigate to the Invite Users panel. Type in an email address to send a direct email invitation to your company Kanbanize account or search for a person in the account by username or email address. The top side of the panel displays all users, which are members of the board. 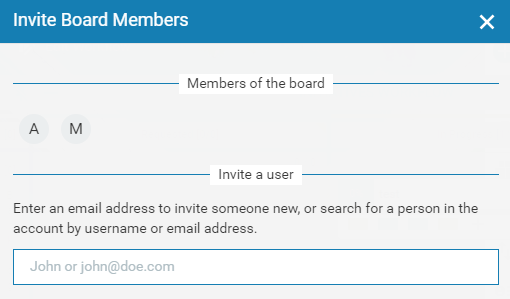 To make an existing user a member of this board, just type in their name in the text box, specify the role and use the "Add to the Board" button. The Search Filters have been introduced to the mobile apps. In addition to that, you can also make custom searches in the whole account - just tap the magnifying glass on the dashboard and enter any search term to be matched against a card's id, title, description, assignee or tags. Right-click on the Initiatives workflow to create a new Initiative via the Context menu. Users can white label their company names on the top left side of the account Dashboard. Just click on the icon to turn it into an editable text box and input the respective company name. A delete button is available in the Archived Projects and Boards tab (Administration) for permanent deletion of Boards in the account.